Here I was in a Duo Discus sailplane with instructor Elizabeth Russell Tattersall, flying out of SoaringNV in Minden, NV in July 2016. We were in mountain wave – way above the clouds! 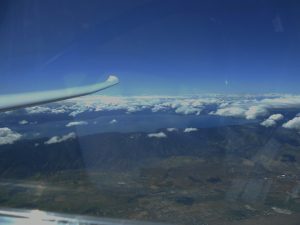 – with Lake Tahoe under the wing. 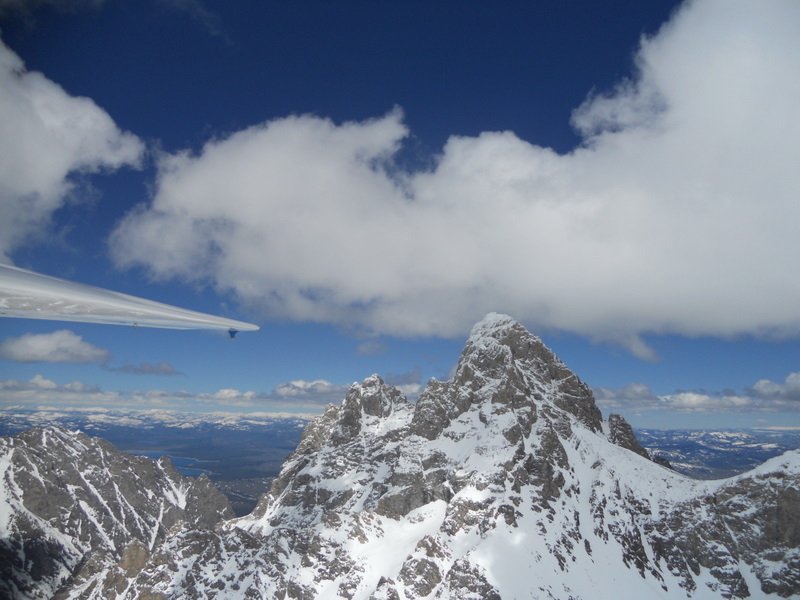 I took this photo from an L-13 sailplane flying over the Tetons in June 2011. Jackson Hole can be seen beyond Grand Teton. Soaring means flying half a mile or more high in a long-winged aircraft without an engine, sailing a metal or fiberglass ship in a sea of air, dancing with clouds…. And enjoying the fun and fellowship of like-minded friends and fellow pilots at soaring operations, seminars, clinics, camps, contests and clubs. My club is the Soaring Club of Houston. 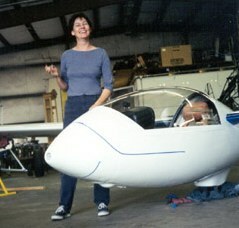 I’ve held a Private Pilot – Glider rating since 2000, but I had to be inactive 2006-2010, due to life happening in spades. 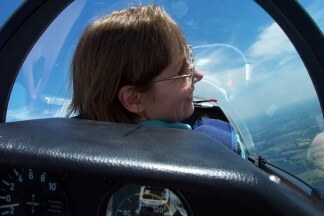 In 2011 I started soaring again. Besides the Soaring Club of Houston, I have managed to fly at Women Soaring Pilots Association Seminars in Dayton OH, Chilhowee TN, Moriarty NM, and Minden NV; at Air Sailing northeast of Reno, NV; in Marfa, TX, with Burt Compton of Marfa Gliders; in Driggs, Idaho, with instructor Sam Lea of Teton Aviation; and in LaGrange, Georgia with Charlie Finn of Southern Eagles, in their Scheibe SF-34, which was a cool sailplane to fly. The Owens Valley east of the Sierra Nevada mountains is legendary for high and long soaring flights. In June 2015 I had one of the flights of my lifetime there with Mark Montague in his ASK-21. After an aerotow out of the Bishop, California, airport, we climbed above the White Mountains, glided across the Owens Valley, then soared above the jagged peaks and tarns of the Sierra near King’s Canyon National Park. The duration of the flight was almost four hours, the maximum altitude 17,300′ MSL (with supplemental oxygen the whole time)! Cross-country is the ultimate soaring. 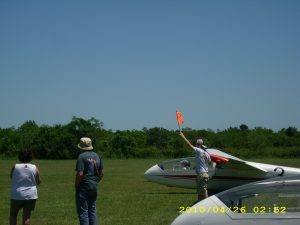 While there are organized contests with the most technically advanced sailplanes racing over courses hundreds of miles long, anybody can go cross-country in any glider with the right planning and conditions. 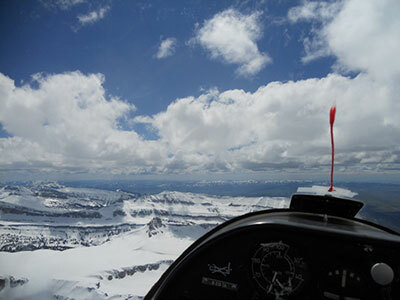 You find lift under cumulus clouds, along ridges, and over mountains and hills. At a great soaring site like Air Sailing in Nevada, you learn that in the American West, where mountainous terrain has always been a formidable obstacle to travel on the ground, for soaring such terrain is how you go far. You use the lift over hills to climb into the sky. You find how ridges and mountain ranges create invisible routes through the air. You discover how the terrain shapes the atmosphere — and how abruptly it can change! 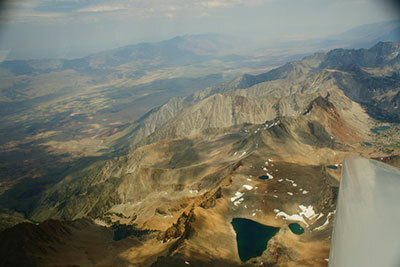 I’m presently editing a nonfiction book on long-distance cross-country soaring in the Great Basin. 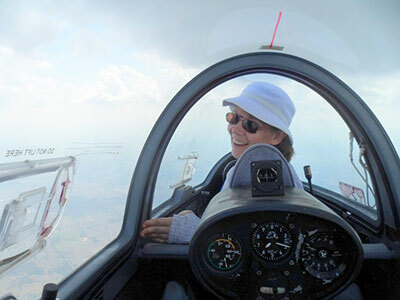 The 36th annual Women Soaring Seminar took place in July 2013 in Moriarty, New Mexico. Moriarty is superb soaring site. 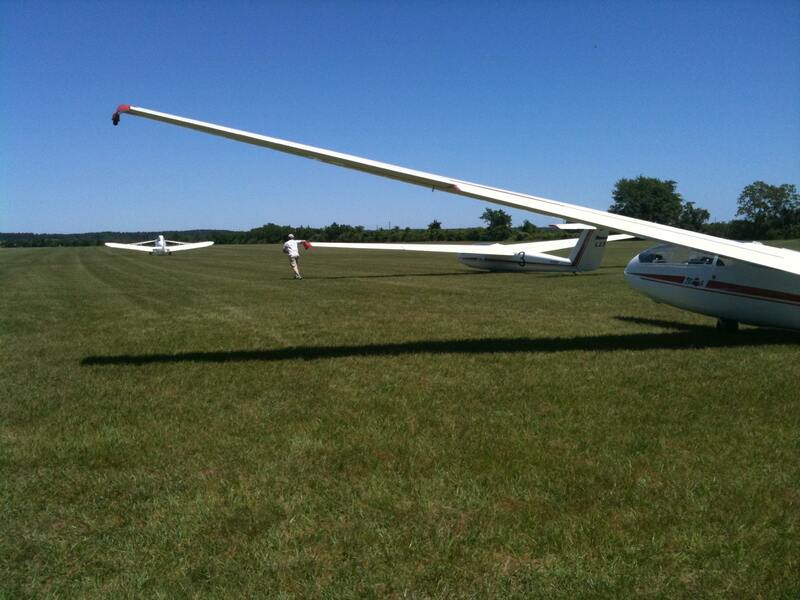 In a summer sky studded with high cumulus clouds you can fly a sailplane for half the day and hundreds of miles. If you’ve never soared, it will be hard to describe it to you. Sailplanes are engineless airplanes. Soaring is falling in style. The really, really fun part is riding thermals up into the sky by circling in the thermal lift. On a good day you can stay up for hours. Floating. Circling under the cool gray bases of friendly clouds. Cloud dancing. In regions other than the Texas coastal plain, sailplanes fly in ridge lift or climb the sky in mountain wave. In 1998, I joined the Soaring Club of Houston as a brand-new, grass-green student pilot. Starting in 1999, I was on the club’s Board of Directors as Secretary for five years. (It didn’t take them long to figure out that somebody who knows how to write comes in handy!). Then I was the club’s Maintenance Coordinator for a couple of years. 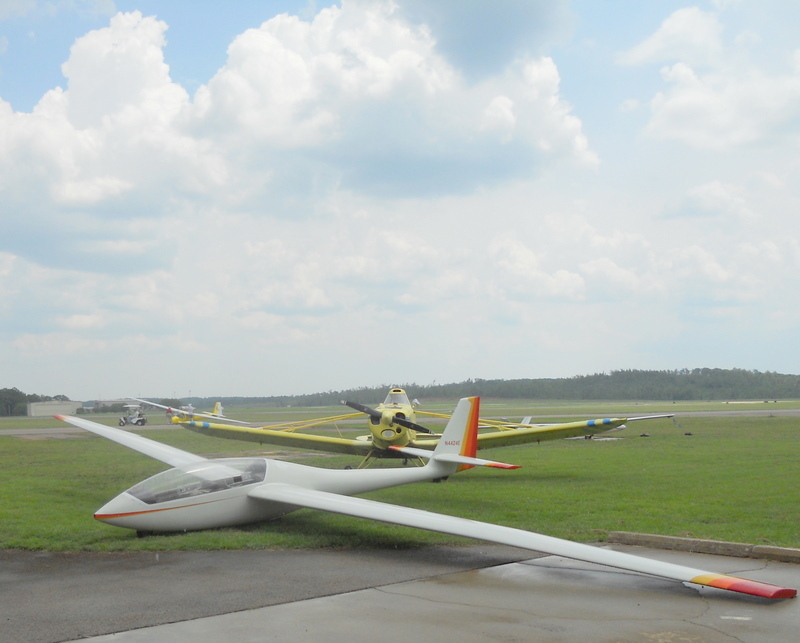 I did almost all of my student training in the club’s Blanik L-23, a capable, medium-performance all-metal glider made in the Czech Republic. It’s psychologically demanding to be a student pilot, not to mention demands on time and money. I had to take a few soaring sabbaticals along the way when I couldn’t make writing deadlines otherwise. But I kept coming back, because soaring can be such an incredible high. At the 1999 Region Ten Contest in Littlefield, Texas, I met a man who said it well. A contest is when pilots in fiberglass racing gliders convene in some of the best soaring conditions the continent has to offer to sail the sea of air in their glass ships, racing to win. It’s highly exciting for all concerned, including those who come to crew for a pilot, which is what I was doing at Littlefield. Midday, mid-contest, Walter, a middle-aged man and student pilot doing crew duty like me, radiated enthusiasm. “Soaring is better than anything else that’s legal,” he said, animatedly. “Or anything that isn’t legal, for that matter!” He’s right. It can be that good. Is it dangerous? In point of fact, yes, it can be. Worth the risks? Yes, it can be. 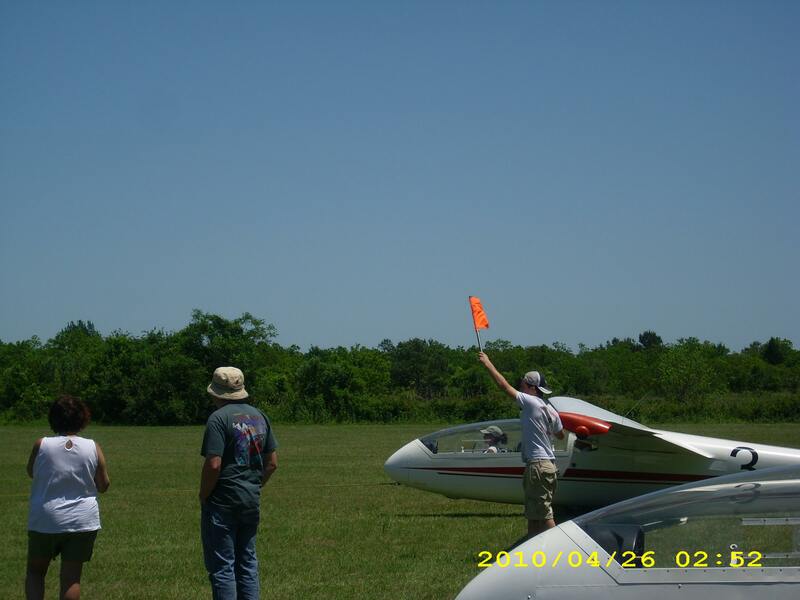 In 2000 I resolved to take my Private Pilot Checkride and become a rated glider pilot by the end of the year. Unfortunately that was the year an August thunderstorm let loose a downburst that wrecked the club’s hangar and destroyed or damaged the whole fleet. The gliders that survived were under repair for months. That December, I spent a week training at Miami Gliders in Homestead, Florida, with instructor Burt Compton. Burt flies L-23’s, so I didn’t have to transition to a new kind of glider. Even better, Burt is an unusually fine instructor. Let’s just say he knocked the rust off me and then some. At the end of that week I had my appointment with destiny in the form of Designated Pilot Examiner Mary Gaffaney; and I became a Private Pilot – Glider. Since then, I’ve checked out in the Soaring Club of Houston’s Grob 103 and Blanik L-33. 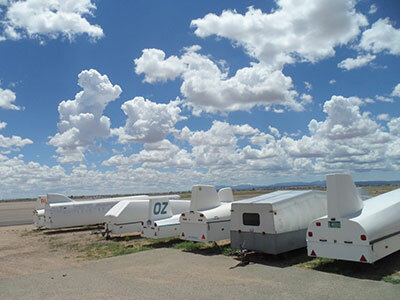 In the summer of 2001, I went to Marfa, Texas, where Burt and Kathy Compton had relocated Miami gliders, complete with tow plane and L-23s. I got some training from Burt in cross-country thermalling techniques, in strong thermal conditions. We flew high enough to see OVER the Davis Mountains. 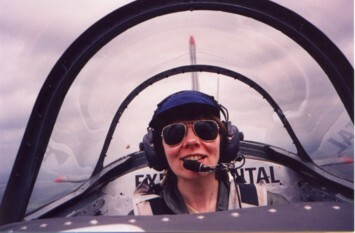 In July of 2002 I went to Dayton, Ohio for the Women Soaring Pilots Seminar and flew over the rolling hills and green fields and glinting Little Miami River. In January of 2003, I attended the Soaring Society of America’s annual convention in Dayton, Ohio. I enjoyed it so much that I went to the 2004 convention in Atlanta, Georgia. A highlight in 2004 was the Awards Banquet at which we all saw an award bestowed for a truly extraordinary event in aviation: the Kuettner Prize, for the first flight in a straight line of 2,000 kilometers, went to Klaus Ohlman, who accomplished it in the remarkable conditions of the Argentinean Andes. Soaring the whole way without an engine. Soaring is a lot of fun, even if you just stay home…. And I don’t! For several years I was the Maintenance Chief for SCOH. This does NOT mean having been a maintenance expert! It meant organizing the work (and paperwork), interacting positively and responsibly with Maintenance Team members, aircraft mechanics, and the Club’s Board of Directors and membership, exercising common sense and good judgment, and on occasion putting my foot down, as in, “No, you can’t fly this glider today. It’s grounded for maintenance.” I’m a big believer in proactive maintenance. For one thing, it prevents mid-soaring-day surprises. I had a hand in the snazzy paint scheme of this little glider! 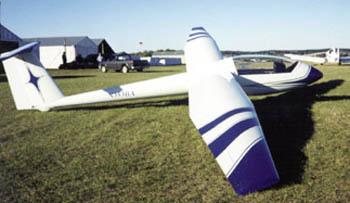 The club bought this Blanik L-33 Solo new from the factory in 1999. It turned out that the whole paint job was bad. The paint peeled off like mange. Then the 2000 storm damaged the poor little ship and all of its stablemates. N353BA and the L-23 went to K & W Aviation in LaPorte, Texas, for repairs. I was the club’s project manager for the repair job – I interfaced between the Soaring Club of Houston and Mr. Bob Wagstaff, the owner of K & W.
I learned a lot about aircraft repair from Bob. He is a master of his trade. Since the glider was in the shop anyway, the club decided to cap off N353BA’s repair with a new paint job. To create and execute a new paint design, I recruited another member of the club, Janaki Lennie, who is a fine artist – a painter. (We have discovered that artists come in just as handy as writers do.) K & W did a superb paint job. Besides repairs, Bob also does aircraft restoration. He and his shop really know how to return a damaged aircraft back to better than mint condition! First the L-23 and then the L-33 came back to the Soaring Club of Houston repaired, restored and gleaming. Not only is the Solo’s blue-white-silver design striking, it is also conspicuous. The Solo is just a little piece of metal foil in a sky crisscrossed with power planes and bizjets, but the paint scheme makes it easier to see. No, this one is not a glider! I’ve flown with Eileen in DragonLady doing aerobatics over Galveston Bay and attended the CJ at airshows. I once flew with Kristin cross-country in PS from Houston to Virginia, and from Houston to Cape Canaveral for a Space Shuttle launch. Our most memorable trip was west to Los Angeles, up to Pocatello, Idaho, and into Jackson Hole and Yellowstone. Flying with these friends in their power planes has been wonderful! But the flying bug didn’t really bite me, but good, until I discovered airplanes without engines. I have been reading out many of your stories and i must say pretty clever stuff. I will surely bookmark your blog.